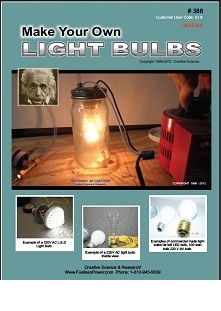 Learn how to make your own light bulbs! teach you how to make them for yourself! LED light bulbs can last up to 60 years, and not burn out! Light up your entire home with these LED bulbs! Rated at: 120V x 3.5 watts each. Save hundreds of dollars on your electric bill! Photo of a LED light bulb. This bulb is included in these plans. 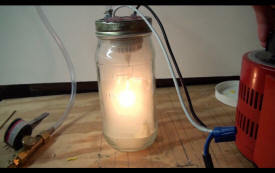 Photos of David Waggoner's homemade mason jar light bulb 60 watts. Step by step plans! Incandescent Light Bulbs That Can Last Forever? In 1892 Thomas Edison used a thin sliver of bamboo to make filaments for his first light bulb. Find out in these plans what type of bamboo he used. William Joseph Jenks explained that the Edison bulb was not derived from the current and sparks that jumped across scores of carbon rods in a series of arcs and lights. But that Edison's lights exploit the fact of the perfect filament operating in a totally oxygen free environment that can last forever! Did you also know that if you ran a light bulb on DC current it will last much longer and will be more efficient than running them on AC. Most people do not know that. By simply connecting a 200V diode or diodes in the light circuit will cause the bulb to run on DC. Convert all the lamps in your entire home. Incandescent bulbs are great and you can make them to last for years, but there is a draw back. They take way to much energy to operate and cost home owners hundreds of dollars every year. They are nice to have in your home as secondary lighting, but I would use LED light bulbs as my first choice! Some people like the Edison bulb because of its superior lighting output. And since the government has put a ban on manufacturing them, people are rushing to the stores to stock up on as many as they can buy. Can be much cheaper to build them yourself. See our step by step plans. LED bulbs will last for many years, and take very little energy to run. We will also teach you how to make your own LED light bulbs. They are great for lighting up your entire home at an extremely low operating cost. They are also great for emergency black outs. 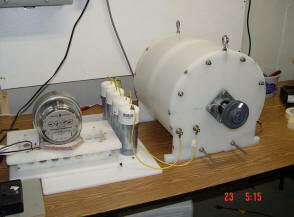 Build our Fuelless Engine motor and our SP500 Generator to avoid any neighborhood blackouts. Make your own electricity! By using super bright white LED's you can have emergency lighting that will not burn out for about 50 to 60 years. Super bright white LED's are the lighting of the future. You can run these bulbs on 120V AC converted to DC, or light up your home using a 12V DC battery bank to run the LED bulbs! It is possible to keep your lights up and running for months without using 120V AC to power them. Burnt Out Fluorescent Light Bulbs! Dont throw them out! You can reuse them. We have invented a way to relight them. You will never need to throw away another florescent light bulb again. This technique was invented by David Waggoner's brother who is also an awesome inventor as well. Free Electricity from the Phone Company. construct! If you have two phone lines, you can double your power output as well as amperage. No, it's not free energy,,, but you can make over $450 per day cleaning roof tops "
There is a chemical that can remove roof rust from home owners roof tops. No need to replace the old roof on homes unless it's leaking. David has discovered a new way that is cheap and simple to clean the black oxy rust from home owners roof tops and make them look like new in just one day! It's safe to use and can last up to 10 years. This chemical can be purchased at your local grocery store. For an average size home it would take about 10 gallons. Simply spray on your entire roof and spray off using a water hose. 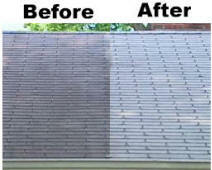 The roof will look like new again and the home owner will be glade because you just saved him over $4000 for a new roof! Question: So why sell the information, why don't start your own roof cleaning business yourself? Answer: David is a scientist, he likes to research and invent things, he has no desire to go into the roof cleaning business. We made these plans to help people who are having a hard time getting by from week to week. Great as a part time business or as a full time business.